If you live in Sterling Illinois or any other surrounding area's Bob Thompson Law Office would love to assist in any way that we can. We are located in downtown Dixon. 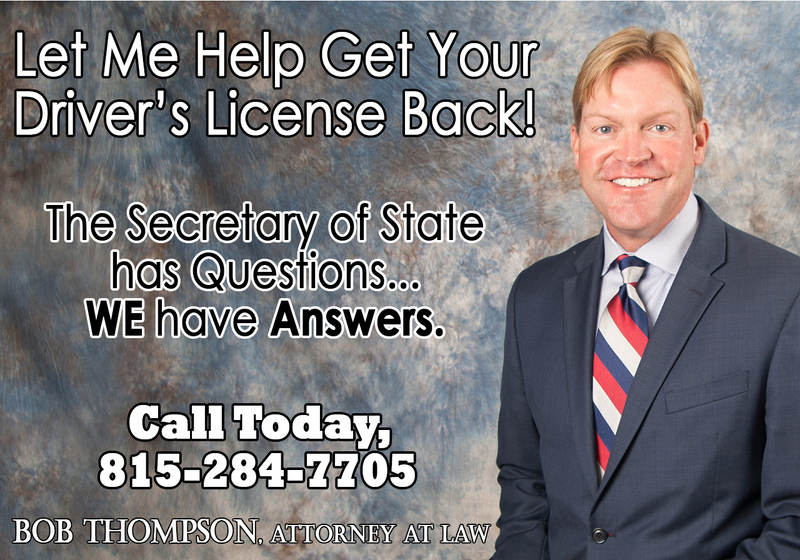 Contact Bob Thompson today to learn more about driver's license reinstatement. The Illinois Secretary of State's Office has imposed strict and often confusing guidelines for driver's license reinstatement after a DUI conviction. If you seek to reinstate your driving privileges you must request an administrative hearing before the Secretary of State. Bob has practiced before the Illinois Secretary of State for nearly 20 years with successful results. did you ever experience an increased tolerance to alcohol? did you ever set limits on your drinking? ever engage in morning drinking? ever drink seven days in a row? ever hide drinking from your family? ever drink fast for a quick buzz? ever have physical problems from your drinking? ever have financial problems from your drinking? ever drink on an empty stomach? did alcohol ever control your life? ever drink until you couldn’t stopdrinking? ever have a family membercomplain? ever ruin a friendship/relationship from yourdrinking? ever drive with your license suspended orrevoked? did you ever drive intoxicated other than thetimes you were arrested? do youneed any more treatment? Why or why not? what, if anything, could happen to get you to go back to abusing alcohol again? what steps would you take to avoid it? what caused you to drink? what is different now that eliminates the reason? what was your low point? do you feel you are a risk to drink even a small amount and drive? Why? do you feel you could safely drink a certain amount of alcohol and drive? Call 815-284-7705 for a free consultation today.